SPINDLE MOTOR AND INVERTER VFD. Steam generator for bath SPA. Listing for Winit and 4PX. 3 AXIS 3040 CNC Router ENGRAVER ENGRAVING CUTTER MACHINE ARTWORK CARVING TOOL. 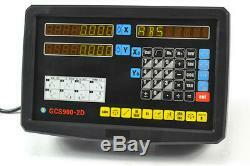 3AXIS DIGITAL READOUT DRO FOR MILLING LATHE MACHINE WITH 3 LINEAR SCALE TRAVEL. CNC ROUTER 6040 ENGRAVER 3AXIS MILLING ENGRAVING CUTTER MACHINE DESKTOP USB PORT. 3AXIS USB CNC 3020 ROUTER ENGRAVING DRILLING MILLING MACHINE 3D CUTTER GOOD ITEM. BiGa 3 AXIS DRO DIGITAL READOUT WITH 3 LINEAR SCALE FOR MILL LATHE MACHINE. BiGa 2 AXIS DRO DIGITAL READOUT WITH 2 LINEAR SCALE FOR MILL LATHE MACHINE. 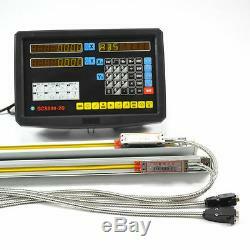 BRAND NEW 2 AXIS DIGITAL READOUT DRO FOR MILLING LATHE MACHINE WITH LINEAR SCALE. 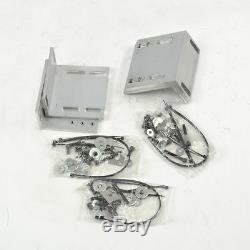 This kits includes 2 axis dro and 2pcs normal size linear scale, complete dro kits. 1, the type of your machine (mill, lathe, etc). 2, the actual travel (mearsure length) and resolution of the scales. 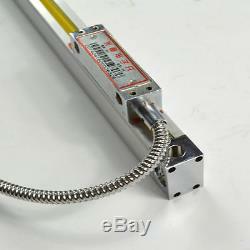 The linear scale must choose from 50-1000mm travel length, for over 1000mm, it cost extra. 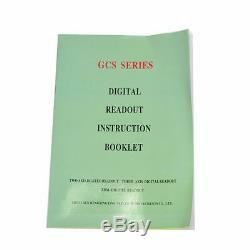 The mill digital readout(digital readout)in GCS series which producted by our company is a high precision instrument that can be used on lathe, grinding machine, milling machine, boring machine and EMD to make the position detection. Coordinate measuring machine , Profile projector, Microscope, Video measuring machine, Movement control, Position monitoring, Coordinate measurement, X-Y working table monitor, Mechanical control, Other area of linear scale and rotary encoder. Function of the mill digital readout. Clear 200 sets Sdm datum; 11. Drilling of oblique line 15. Machining of inclined plane 16. Machining of circular arc 17. Rectangular lumen gradual processing 19. R function 21 R/D function. In total , it is a mutlifunctional 2 axis DRO can be use on lathe machine, mill machine and other machines. 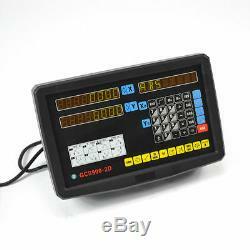 The high precision digital readout is specialization design, elegant appearance , high speed of numeation, multy function. 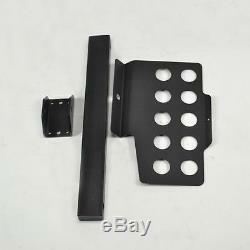 Aluminum ally , spray plastic appearance , dustproof and wear-resisiting, good shield. Independent power, widely used, high stabilization, capacity of resisting disturbance well 4. The power source and the signal have a good capacity of resisting disturbance, durable keyboard, easy to change 5. Automatic tool compensation for both X and Y. Input Signal: TTL square wave EIA-442. 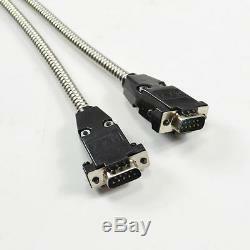 Length resolution: 10um , 5um , 2um , 1um , 0.5um. Operation Keyboard: pressure sensitive key pad. Type of the lathe Suitable Specification(mm). Milling machine NO 2 1micron/5micron 700350. Milling machine NO 3 1micron/5micron 800400. Milling machine NO 4 1micron/5micron 900470. Grinding machine 618 1micron/5micron 350200. Wire cutting machine NO 25 300400. Wire cutting machine NO 32 400470. Wire cutting machine NO 35 400500. Wire cutting machine NO 40 470550. Wire cutting machine NO 45 450550. Wire cutting machine NO 50 600700. Resolution : 5um (0.005mm) 0.0002. Signal : TTL square /wave EIA-442. Grating pitch: 0.02mm (50LP/min). Accuracy: ±0.005 mm or 0.0002 (at 20 deg C). Reference marks at interval of 50mm. Response Speed: 60m/min or 40ins/sec. This is a complete kit. You just need hook the readout system to your machine. It includes one 2 Axis DRO, two scales (each with 3m cable, longer cables are available), protective covers, brackets, etc, an english manual and all the accessories for installation. Hope you will love our items. Any questions will be answered promptly, so please feel free to let me know your concern. Please do check everything carefully when receiving the package. Failure to do so might result in damage to your own rights and interests. If the item(s) sent from CHINA. The item "BRAND NEW 2 AXIS DIGITAL READOUT DRO FOR MILLING LATHE MACHINE WITH LINEAR SCALE" is in sale since Tuesday, October 27, 2015. This item is in the category "Industrial\Heavy Machinery Parts\Manufacturing Equipment Parts\Digital Readouts".jean" and is located in shanghai door to door service. This item can be shipped worldwide.